This category includes hand painted rovings made from Falkland wool. 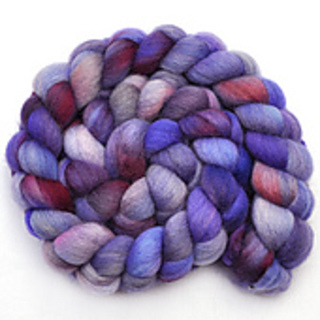 Most individual rovings weight approximately 4.0 oz., or about 113 g.
Falkland is a strong, soft fiber from the Falkland Islands in the Southern Atlantic. It is a 24 to 28 micron fiber with approximately a 5-inch staple. This is a very white wool that dyes beautifully and spins very nicely, but is not a specific breed, rather grown to a specification and blended. There are Corriedale, Polwarth, Dohne Merino and other breeds on the island. Since there are no sheep diseases on the islands, the animals are never dipped so there are not any organo-phosphate or pyrothroid sheep dip residues on the wool. My rovings are dyed with fairly even distribution of colors. 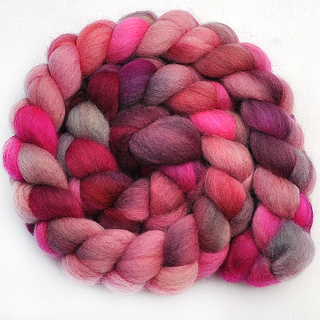 These are the same rovings from which I spin my yarns, so I dye them for that. Except for specialty fibers, rovings are priced at $3 an ounce. In the Pink, 3.9 oz. All rovings are one-of-a-kind handpainted. See my Etsy store at http://edgewoodgardenstudio.etsy.com for all my yarns and rovings.